As a child prodigy, Samuel Reshevsky was at home on the chessboard. One of the best American players ever, he was also a strong contender for the World Championship for 30 years. As Bobby Fischer came on the scene, their fierce rivalry combined with the trash-talk between them made each of their encounters a “can’t miss” game. Known as a brilliant positional player, Reshevsky could also pull out the tactics when needed and played some of his best chess when he was low on time too, unsettling his opponents in the process. Samuel Reshevsky learned to play chess at age 4 and at age 8 he was able to beat strong players easily. His parents made a living by showing off his talents in exhibitions around the U.S.A., playing thousands of games in the process. This honed Reshevsky’s skills and he later became the U.S. Chess Champion for the first time in 1936. He followed this up with winning the U.S. Championship 6 more times throughout his life. He became a World Championship contender in the mid-1930s and continued to be a contender through the mid-1960s. When Bobby Fischer started his rise, Reshevsky and him started a fierce rivalry as two of the best players in the U.S.A. Fischer got the upper hand the majority of the time but despite the known malice between them, they both had much respect for each other’s games. 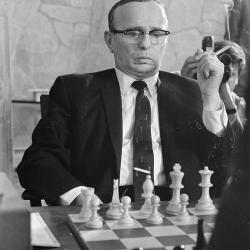 Reshevsky continued to be a great player throughout the rest of his life as well, before he passed away on April 4, 1992.